Willian's Instagram post is out of order and a clear indication he will leave this summer. 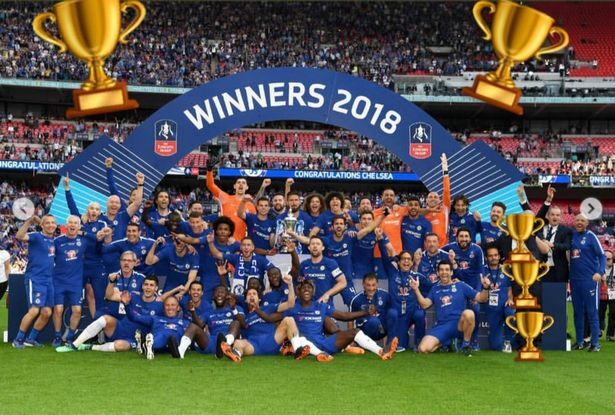 It was a social media post that has caused outrage amongst the Chelsea fans on Saturday night - Sunday as Willian chose to place three trophies down the right hand side of the image above to remove Antonio Conte from the celebratory photo. I believe that the photo has been taken down but, as many Chelsea fans have stated, it was out of order and disrespectful - damaging his reputation and giving a clear indication that if the Italian head-coach stays beyond the summer, he will leave Chelsea. It's no secret that Jose Mourinho wants Willian and it was worth noting watching the re-run of the FA Cup Final that before kick-off as the players were warming up, there was an embrace between Mourinho and the Brazilian with words spoken. Willian had covered his mouth so the camera's could not pick up what he was saying but for me it's the start of another situation we will have here that we had a year ago with Nemanja Matic. If Willian wants to leave the club then so be it - let him go because it's now more important than ever to have players who want to be here next season and are 100% committed to this club. Anyone not happy for whatever reason needs to go. 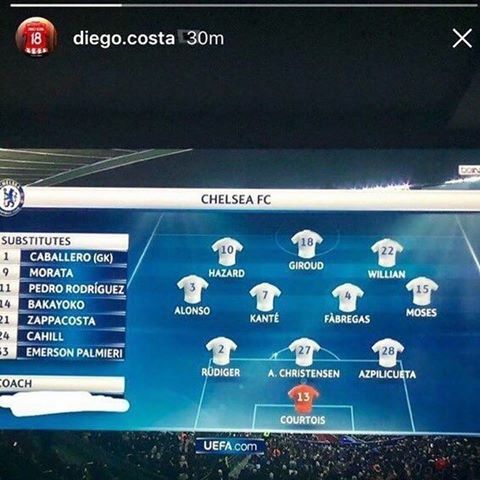 Diego Costa started all this off on social media with his post earlier in the season looking at the Chelsea team and formation for a Champions League fixture at Barcelona. As you can see, he refused to acknowledge Antonio Conte and scrubbed out his name from the listing on the left hand side. Now Willian has come out with this. I just wonder if Antonio Conte thinks that the mentality of the South American players is suspect here because he fell out with Diego Costa last year, he fell out with David Luiz this season after the Brazilian criticised his tactics and now Willian for dropping him in favour of Eden Hazard? I personally have become more than frustrated with Willian in recent weeks. We are so used to see him work hard and put real effort into games almost taking them by the throat at times as we saw earlier this season. Of late, he spends too much time moaning at the officials for not being given free-kicks or walking back into position if he or Chelsea loses the ball. I agree 100% that Willian should have been benched in recent weeks and if he cannot handle that because he thinks that his performances have been good enough to warrant a regular start then he can leave because he has become deluded in my view. One way or the other, I can see Willian signing for Manchester United in a deal that could lead to Anthony Martial coming to Chelsea. I'll take that all day long now would you?